While the long Dirndl is worn at traditional events, such as weddings, Christian festivals and processions, Mini and Midi Dirndl are particularly popular for younger women and more casual events such as private celebrations, festivals or parties. 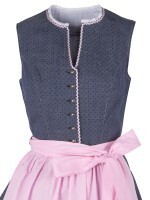 The classic Dirndl has a long tradition dating back to the 19th century. Nevertheless this clothing item is just as fashionable as it has been back then and is also worn far beyond the German borders. Even though it is hard to believe due to today's popularity, the classic Dirndl was initially a clothing item for service maids, usually made out of cotton or linen. It was not until 1870 that this original work dress developed into a popular fashion item in the larger cities of the Alpine region. Within the framework of this period, different fabrics, more elaborate cuts and fine embellishments were established. Cut, Color and Length: What distinguishes the Midi Dirndl? 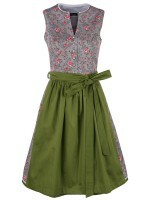 While the skirt length of a Midi Dirndl reaches to the knee, Mini Dirndl are even shorter. With both models you can wear, as desired, Trachten shoes, pumps, ballet flats, sneaker or high-heels. 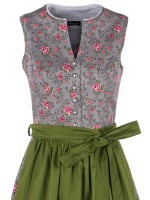 Modern Midi Dirndl can be found with any pattern, color, fabric or button detail. You can choose a model with a sweet stripe or heart pattern, an expressive, feminine trend color like violet, pink or baby blue, an extravagant fabric such as satin or silk and the matching dirndl apron. Traditional or Casual: On what occasions does a Midi Dirndl fit? Whether at Oktoberfest, festivals or parties — a so-called Midi Dirndl is always the perfect choice for women wanting to combine style and tradition. Anyone who appreciates being in the center of attention can wear the modern Bavarian fashion in everyday life as well, since these comfortable and pretty pieces do not have to hide behind modern summer clothes! 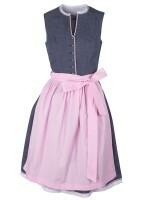 With great accessories, the Midi Dirndl outfit can be perfectly complemented! Indivisibly linked to the Dirndl is the typical apron whose loop, depending on how it is bound, betrays something about the relationship status of the wearer. Regardless of whether you choose a cotton Midi Dirndl or a sweet balcony Midi Dirndl dress: In our wide range, you will surely find a beautiful Dirndl that suits you perfectly — thanks to sizes ranging from 32 to 50. Please help us to spread Bavarian fashion all over the world!